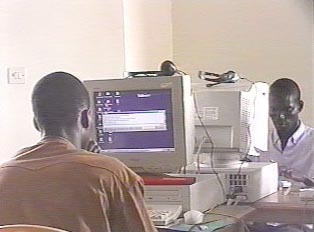 With the increasing popularity of the Internet among students, many cybercafes have sprung up in Senegal even as the cost of computer rental goes down. In the city, a cybercafe may be attached to a restaurant and have a special waiting room. As one moves out of the city, cybercafes become smaller and consist simply of a pleasant room of two or three computers where one can buy drinks and snacks. Those waiting in line generally wait on the street. The Internet is not yet available in libraries, and except for very rich families, not available in homes. Electricity is very expensive in Senegal, and it is also the case that many families do not want to expose their children to the Internet until they are more mature. Many times, computers in local residences are used merely as word processors. "Buying Time at a Cybercafe"